DAYTON, Nev. – RTP Company, a global manufacturer of thermoplastic molding compounds, is preparing to reopen its Dayton facility, which has sat largely empty since the company shuttered the plant in 2001. The plant is scheduled to open near the end of 2017. 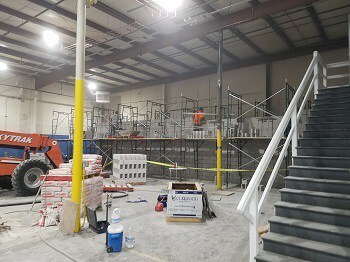 Northern Nevada based Shaheen Beauchamp Builders is the acting general contractor on the project, which includes interior tenant improvements, updated restroom facilities, updated mechanical and electrical systems, new energy efficient lighting; and recirculating process water chillers used during manufacturing. Greg Whitten, plant manager for the RTP Company’s Dayton facility, said the company is rapidly expanding and estimates the Dayton plant will initially look to hire 25 employees. About 50 local workers have been deployed on the project through various sub-contractors’ companies. Photo cutline: Construction crews work on the renovation for RTP Company in Dayton. The company is preparing to re-open the facility by the end of the year. Photo cutline: Interior repairs being made at RTP Company in Dayton. The company is preparing to re-open the facility by the end of the year. About Shaheen Beauchamp Builders, LLC: Shaheen Beauchamp Builders, LLC, a commercial general contracting firm founded in 1998 by Jeff Shaheen and Mark Beauchamp, has built millions of square feet of industrial, office and retail space throughout Northern Nevada. Located in Carson City, Nev., Shaheen Beauchamp Builders offers renovation, remodeling and new construction services and prides itself on astute attention to detail and customer satisfaction. Notable projects of the company include the renovation of 777 Center Street in Midtown Reno, Carson City Animal Services, Carson Medical Group Obstetrics and Gynecology and Pediatric Clinics and numerous projects on the Click Bond, Inc. campus in Carson City. For more information, visit www.sbbuilders.com or call (775) 885-2294.